Tonight’s episode of The Flash season 4 features the return of a fan-favorite character in a more recent iteration. And while that person has been in all the previews, photos and trailers, I’ll wait to mention them until after the photo for anyone not wanting to know… but still clicking on these links. 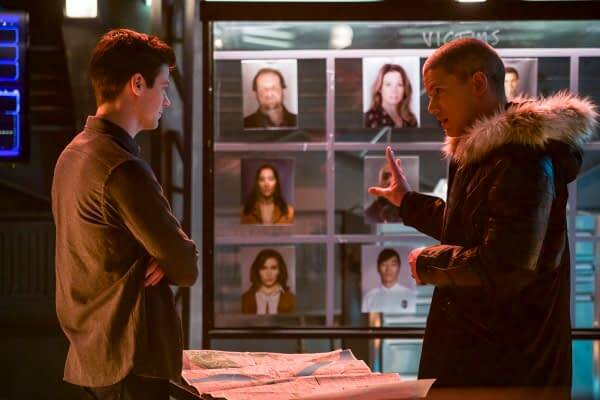 Wentworth Miller returns as Citizen Cold, the Earth-X counterpart to Captain Cold that we meet during this year’s crossover event, Crisis on Earth-X. This Leo Snart has a thing about helping people deal with loss and after the Legends lost Martin Stein (Victor Garber), he stayed with team to help them grieve. In a scene from tonight’s episode, Barry (Grant Gustin) enlists his aid to help move Fallout (Ryan Alexander McDonald) to some place the Thinker (Neil Sandilands) can’t find him. And moving someone with that power needs to have someone on hand who can cool him off if he starts to charge up. That’s something Killer Frost (Danielle Panabaker) could’ve done until DeVoe took away her powers. In the still photos for tonight, people noticed a ring on Snart’s finger. His last scene on DC’s Legends of Tomorrow had him telling the others that he was leaving to go ask The Ray (Russell Tovey) to marry him. The internet saw the ring and figured they were married. But the scene in the video below says otherwise as Leo tries to help Barry deal with the death of Ralph Dibny (Hartley Sawyer). My guess is he’s wearing an engagement ring.